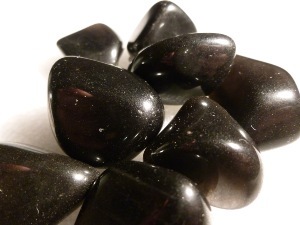 Apache Tears are a variety of Obsidian, a silica rich, glassy volcanic. Native to Mexico and Southwest in the United Sates. The name "Apache tear" comes from a legend of the Apache tribe: about 75 Apaches and the US Cavalry fought on a mountain overlooking what is now Superior, Arizona in the 1870s. Facing defeat, the outnumbered Apache warriors rode their horses off of the mountain to their deaths rather than be killed. The wives and families of the warriors cried when they heard of the tragedy; their tears turned into stone upon hitting the ground. Apache Tears are an emotional crystals, it is said to help those who are grieving and are feeling trapped in their emotions. With the love of the Apache Tribe, sharing their love and strength, helping one to see through the sadness towards a positive future. These stones lend general strength and stamina, help to vitalise and purify the blood, stimulate hair and nail growth, and boost the immune system. Apache Tear tumbled to a smooth finish, an ideal pocket size stone, small enough to carry around with you. Tumble Stones can also be placed around the home for their energies or can just be nice decorative items. Apache Tear crystal gemstones of varying sizes selected specially for your order.